Palm has announced a press conference with both Microsoft and Verizon Wireless for Monday the 26th. This can only mean one thing... The Treo 700w will be officially announced. The announcement begins at 9AM and will be held in San Francisco. Since Verizon is part of the conference and their logo was on the leaked images, expect them to have an exclusive on the Treoo 700w for some amount of time. 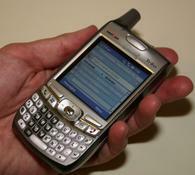 Sprint had the exclusive on the Treo 650 last year. CTIA IT begins in San Francisco the very next day.